In trying to understand what the rapid changes in the Horn of Africa mean, and while searching for the undercurrents (unknowns) that brought the changes, and trying to predict what the future of the region holds, this writer, who owns no crystal ball, is reaching to others for explanation. Scouring through my modest collection of favorite books I am re-reading Nassim Nicholas Taleb’s “The Black Swan: The Impact of the Highly Improbable”. The Horn of Africa is home to hundreds of birds. But this is not about birds…Black Swan is a metaphor for the game changer. Just because one does not know about something, does not mean that it does not exist. Black Swans can be positive or negative and there have been many events in the Horn of Africa that can be considered as such. In addition to Eritrea’s independence in 1991 there have been important and decisive events that had ramifications far beyond Eritrea and the region. These events were for the most part unexpected, and left both foe and friend in awe. Suffice it to mention a few: The liberation of Nakfa in 23 March 1977, the ‘Battle of Afabet, the demise of the Ethiopian Nadew Command in 1988, and the historic Operation Fenkil in 1990, are events that changed the course of history. The most significant and most unexpected event in 2018 in the Horn of Africa is the downfall of the TPLF regime in Ethiopia and the ascension of Prime Minister Abiy Ahmed. This “Black Swan” event in the Horn blindsided analysts, experts and journalists in the region. Some are still having difficulty understanding the collapse of a regime they believed was too entrenched to fall. How is it that these pundits could speak with certainty about Eritrea- where they say they had no access, was “secretive” etc. etc. but were unable to see what was happening right under their noses in Ethiopia, where they had access galore? So who accurately predicted the fall of the regime in Ethiopia? In an interview in 2002, GeneralSebhatEphrem, speaking about the historical mistakes made by the TPLF (Woyane) regime in Ethiopia, said that the pathway (????) for fundamental change in Ethiopia had begun- that the die had been cast…that it was difficult to say when and how that change would come, but that the course had been irreversibly set, that the end of TPLF was inevitable. He said that historical changes come from the things that cannot be seen, from the unpredictable, the undercurrents, or as Taleb says, from the unknown. But predicted, nonetheless the fall of the regime-almost 16 years ago. The Brooking Institute missed the Black Swan in the Horn of Africa when it produced, “Big Bets and Black Swans-A Presidential Briefing Book” for Barack Obama’s second term. Did that contribute to Obama’s misspeak during his visit to Ethiopia in 2015 in which he labelled the regime as “democratically elected’. Was he swayed by the briefing he was getting from his advisors or was it his own bias at play? It was not long after Obama’s visit to Ethiopia that the protests began. They started in 2015 in the Oromia region and quickly spread nationwide, paralyzing the government, which was forced to declare a “state of emergency”. Ethiopia was governed by listening posts and the killings and mass detentions to squelch the uprisings continued. But one could not tell what was happening from reading the daily barrage of feel good stories in the mainstream media. Let us take a look at one such report. It was not because he did not know what was really happening in Ethiopia, he did. So while there was an abundant supply of information coming from Addis based analysts, diplomats, journalists as well as intelligence personnel and military technocrats of every variety…the narratives varied greatly from the reality on the ground. 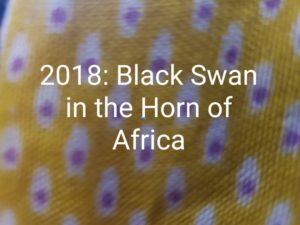 Black Swans have rocked the status quo in the Horn, making 2018 yet another historic year and this event has turned accepted narratives and long held beliefs about the region and its people, upside down. Despite volumes being produced about the region and its people…most of it turned out to be just a lot of noise…and the noise distractedmany from the truth. If against all odds defined Eritrea’s long struggle for independence, the most improbable describes its post-independence feats….and truth remains the signal.